the fash pack: can somebody come up with a funny caption for this pic? can somebody come up with a funny caption for this pic? "hurry! 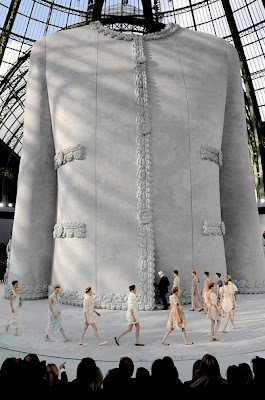 before gulliver finds out we're making a chanel jacket for him." btw, you made the first shot of galleria look really foreign (or it just really looks foreign). Ganda na pala nya. "cloverfield monster, i am your lola." So that's what it would look like if the Statue of Liberty were to get new clothes! now a chanel supah sized jacket for bare breasted 70s japanese anime robot aphrodite A (side kick of mazinger z) or any female bozanian beast fighter!